Home > Latest News > Career Advice > How should you adapt your CV for the industry in which you want to work? How should you adapt your CV for the industry in which you want to work? Did you know that the way you present your CV varies by industry? 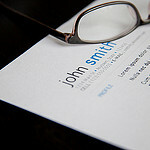 This site presents sample CVs by industry and gives you idea how you can customise your resume. Remember that you may also need to customise your CV depending on the country in which you are applying work as well! Working in Banking, Engineering or Marketing? Read these examples!